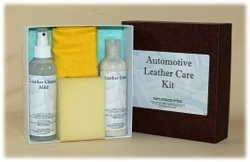 Automotive Leather Care kit designed to clean & protect car leathers. With the added benifit of an Anti Bacterial addative to help protect against damage from condensation. 1 x 200ml Leather Cleaner Mild with anti bacterial additive. 1 x 200ml Leather Cream with anti bacterial additive.